At airports, train stations and bus stops, digital signage improves the travel experience by serving a variety of functions including displaying timetables, service status, public announcements, and route-finding. 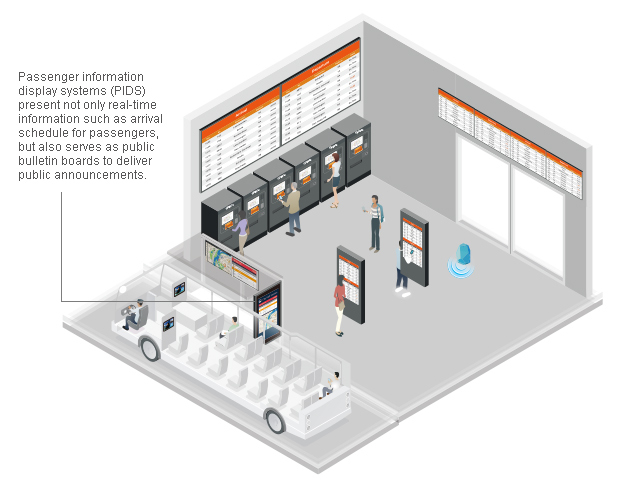 To operators, centralized digital screens effortlessly enable them to manage traffic within terminals and guide passengers to their destination dynamically. Moreover, with aid of the cutting-edge technology from graphics and Ultra HD (4K2K), eye-catching displays help to attract audiences’ attention and boost sales from the advertisements. In mission critical applications such as FIDS and PIDS, system reliability is the key to keep up service consistency and reduce maintenance effort. 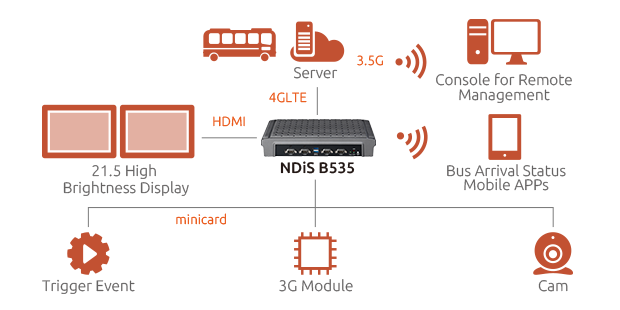 The NDiS B535 has been installed in 300 bus stops in Asia and delivers real-time information such as bus arrival schedule, local weather, up-to-date news, and streaming video. 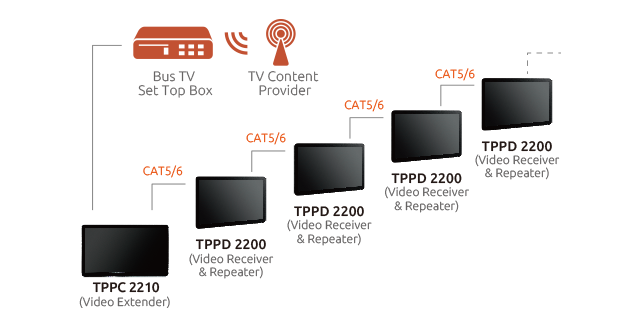 On mobile carriers like buses or trains, it is mandatory for systems to withstand severe temperature variations and be capable of downloading and processing large amounts of data from a backend server. The NDiS B535 can also install various communication modules such as Wi-Fi/3G/4G to enable interactivity with passengers, thus enriching the appearance of the presentation. TPPC 2210, the Passenger Infotainment Display Solution, is now available in Master Panel PC and extended to several displays. It is a fully flexible modular system with solutions for different system environments and space requirements. The 21.5” display size with modularized structure can easily customize to 2x21.5” (side-by-side and back-to-back displays in one frame) and different display sizes (18.5”, 24”, 27”,…) , on which route information and advertisements can be displayed simultaneously. All variations use the same elegant aluminum frame, so mounting and installation are particularly easy. The low weight and low maintenance approach make sure environmental impact and operating costs are kept to a minimum. TPPC 2210 can display any kind of information that is necessary to ensure passengers have a safe and smooth journey. This includes next stop information, detailed route information, a network map as well as operator information such as service interruptions. In addition, general news can be shown on the newsticker function. Otherwise, this infotainment can actually be used to make money! TPPC 2210 can display all kinds of advertisements and can therefore be integrated into a business plan as an additional source of income. Installed in bus shelters, the NDiS B535-powered ETA systems provide passengers with real time bus arrival information. Connected to central servers over LTE networks, the ETA systems update ETA data constantly so passengers can find up-to-the-minute information of dozens of bus routes on two display panels and arrange alternatives if necessary. The bus operator can also use the ETA systems to communicate with passengers—issuing change of schedule notices resulting from major events or broadcasting severe weather warnings. NEXCOM’s Passenger Infotainment Display Solution is available with a Master Panel PC and an extended display to flexibly meet space and environmental requirements. The 21.5” Master Panel PC has a modular structure supporting the dual-display configuration. An extended display can be placed either side by side or back to back in one frame, showing synchronized information and advertisements.